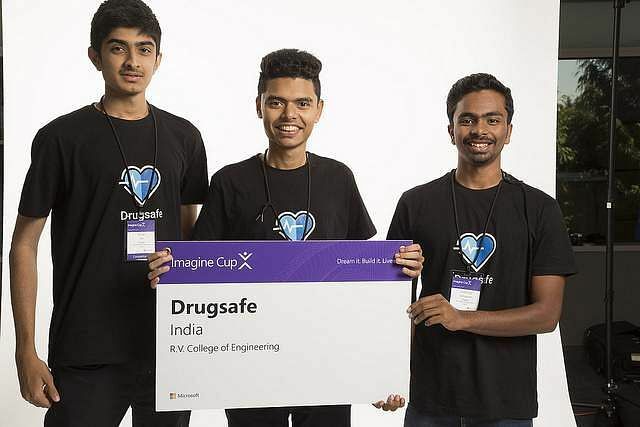 With an aim to help people verify the authenticity of medicines available in the market, three students of RV College Of Engineering have developed an app called Drug Safe. Meet Chidroop I, Pratik Mohapatra and Srihari HS who are the masterminds behind this app which helps people identify fake medicines. This unique contribution towards medical industry has won them $15,000 Big Data Award at the Imagine World Cup Championship, 2018 conducted by Microsoft in the USA, last week. The Computer Science students were struck with the idea of developing this app after one of their friends who was very ill did not show any signs of improvement despite taking medication. Drug Safe app co-creator, Srihari said,"We were shocked to learn that there were 40 percent medicines in the market that were fake. We were even worried about other people who consumed these medicines. That is when we thought of developing an app. This app helps people verify the originality of the medicine and also trace its source." Explaining how the app works, Srihari said, "The Optical Character Recognition technology used in this app scans the minute details of the medicines which include the design and packaging. It compares the medicine to the original one which is patented. The differences that are found will be flagged to help people find out if the medicines are fake. The user of this app is allowed to view the batch number, date of manufacture and other details if the medicine is original. Every medicine will have the description of what content is being used in the preparation and the dosage to be consumed." Apart from the details of the medicine, the app also gives details on health care and alerts the user about a possible disease outbreak in the area or other parts of the state. However, the app is still not available for the commercial use. "In the coming days, we want to work on this app and improve it. We want to see that the app can be used by a larger number of people, "he added. The team faced tough competition from 10,000 other colleges at the national level and 45 colleges at the international level. When asked about how they feel about winning the award, he said, "We had participated last year and had worked on an anonymous emergency response system. Sadly, we could not reach the finals. The hope that we will win in the competition this time took us all the way to the USA and we were so proud that we were one among the three colleges to be selected to the competition." Meanwhile, the students want to use the $15,000 to develop their app and also partner with other companies,"We still want to incorporate some more options in the app to make it more user-friendly.